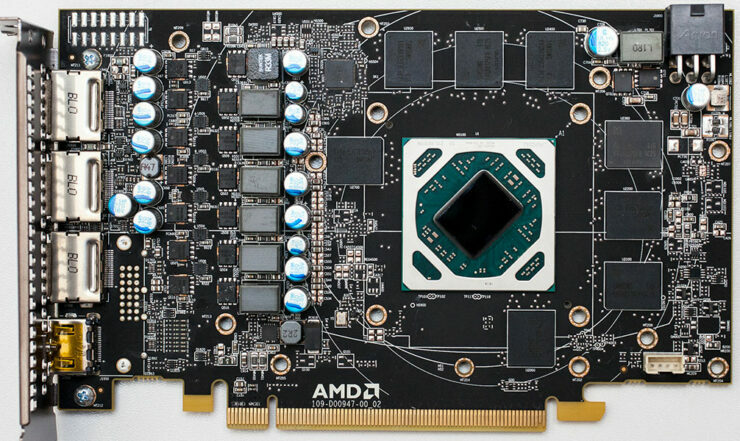 The AMD Radeon RX 480 has come under scrutiny since its launch two days ago due to controversy surrounding PCIe power draw of some GPU samples sent to the press. Several reviewers have found that their RX 480 review units drew more than 75 watts of power from the PCI Express slot. Which according to the PCIe spec, the slot should not provide more than 75 watts of power. PC Perspective, a well respected technology publication, has since published its results upon further investigating the issue. Ryan Shrout, Editor-In-Chief at PCPer.com, conducted PCIe slot & 6-pin power draw testing with an elaborate setup that interrupts any current going through the PCIe slot and 6-pin power connector before it goes to the card. 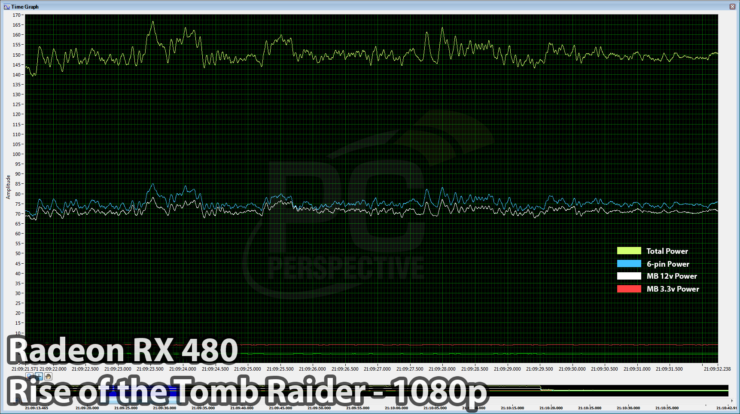 To mimic a realistic workload the power measurements were taken in The Witcher 3 & Rise Of The Tomb Raider. In Rise Of The Tomb Raider the load on the PCIe slot’s twelve volt power rail hovered around 70 watts throughout with a couple of spikes going up to 77 watts. In The Witcher 3 the results were nearly identical. Power draw from the motherboard’s 12 volt rail hovered around ~73 watts throughout with two, less than one second, spikes going up to 77 watts. Clearly then on both occasions the RX 480 exceeded the 75 watts. In both occasions however it was marginal at best, lasting for less than one second. The very frequent spikes beyond the motherboard slot’s supposed limit won’t cause immediate damage to the hardware, but there might well be long-term repercussions that are hard to judge now. The same goes for how the system might otherwise be impacted with problems such as “chirping” on-board sound when the mouse is moved. 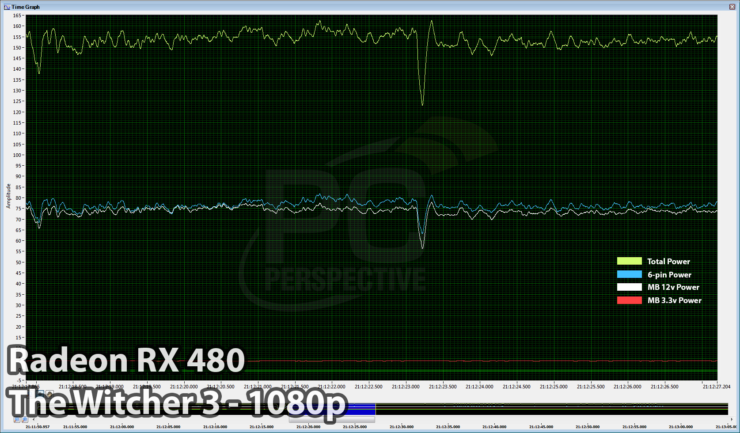 The Asus GTX 960 Strix should do a much better job smoothing these spikes out. Interestingly, PCPer followed up Tom’s testing with their own. Which did not show a similar behavior on the GTX 960. Although notably, Ryan Shrout explains that this is because a second order filter is applied. To negate the effect aberrant spikes would have on the data. Which is quite helpful when we want to look at the typical power consumption over a specific period of time. The issue is that when these outliers occur often enough that they’re no longer aberrant. As they’re no longer occurring over a minute amount of time but are still filtered out, substantially reducing the reliability of the data. Looking at Tom’s Hardware’s RX 480 PCIe slot power measurements. We see a higher power draw on average than the GTX 960 but with significantly fewer spikes. Usually spikes can be disregarded as the result of an electrical component’s switching current. These spikes can and should be ignored, especially when we’re talking about spikes that don’t last more than a few milliseconds and are a natural phenomena. However, in the case of the GTX 960 we see a spike occur almost every other second that lasts over a substantial enough period of time to register on Tom’s 60 second power measurement graph. In fact almost every one of those spikes lasts for roughly one second and touches 150W. A behavior that is quite different from the RX 480 and is worth paying attention to. The primary cause for any electrical component failure related to electrical overstress is thermal fatigue. Prolonged, repeated thermal cycling leads to current crowding which then leads to thermal runaway and ultimately component failure. In other terms the primary cause of component failure caused by overcurrent is temperature related. The process of cycling through two temperature extremes is what’s called thermal cycling. The higher the current spike – and the more it’s out of the component spec – the more extreme the delta is between the two temperature states. Eventually the heat will damage the component and it will fail. The bigger these spikes get and the more frequently they occur, the faster this damage will take place. 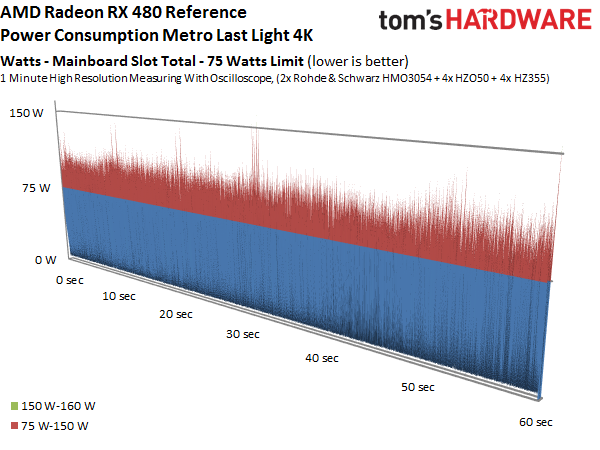 While GTX 960 power measurement data sets from Tom’s Hardawre & PCPer do show disagreement the publications are in agreement about the RX 480. Their verdict appears unanimous and is this “Don’t read too much into it!”. As long as the RX 480 is not overclocked, its PCIe slot power draw should not be cause for concern. 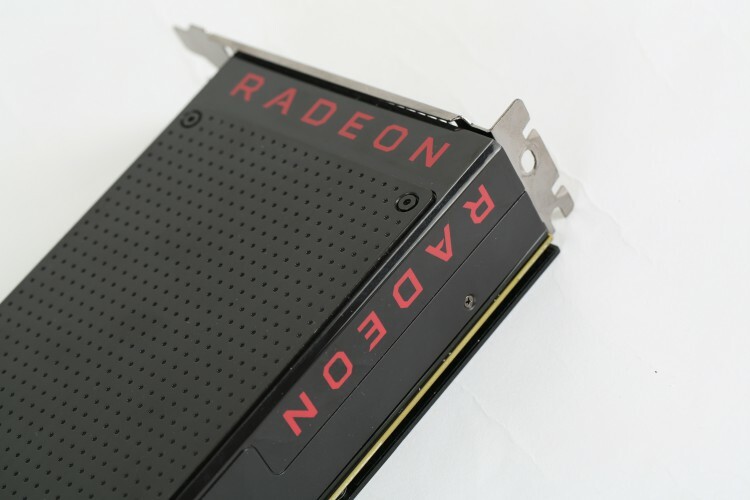 As is usually the case in this market, there are some asking for a recall on the RX 480 or saying that AMD is going to be liable for some kind of class action lawsuit. I don’t agree with either sentiment. AMD is clearly pushing the envelope with the power delivery system on the Radeon RX 480 and we have shown that they are definitely drawing power outside PCI Express specifications even at stock clock speeds and power settings. I haven’t run into any stability concerns yet nor have I heard of any other reviewers indicating as much. As the RX 480s start to reach consumers hands today and later this week, I will be paying close attention to community reports while doing our own longer term testing at PC Perspective. 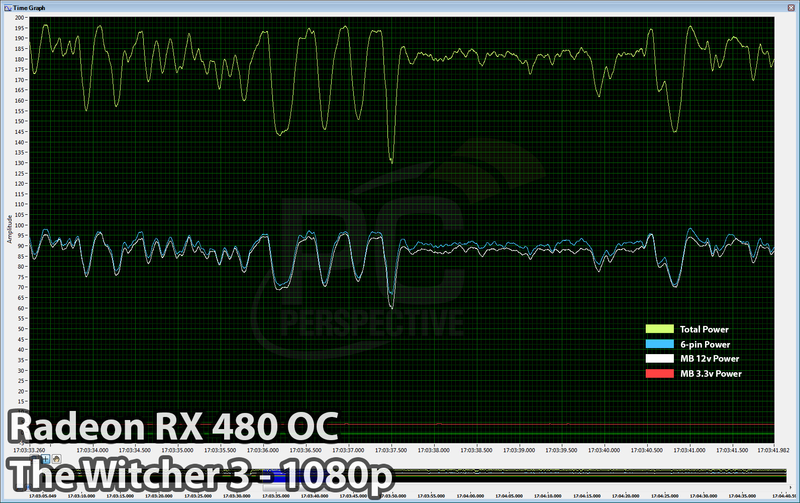 Because this occurs only with overclocked settings, AMD is not actually responsible for the specification breach in this specific instance, even though the company has talked about the overclocking headroom available on the RX 480 directly. This is a good reminder as to why GPU vendors, both Nvidia & AMD, are emphatic about overclocking voiding the warranty. Something that users should keep in mind. It’s clear then that if you intend to overclock you’ll be much better served with a custom RX 480 from AMD’s AIB partners. Sapphire, XFX, Asus & MSI all have their own custom RX 480 designs lineup for release. Those are their own RX 480 designs with better cooling and more importantly 8-pin PCIE power connectors. These can provide up to 150 watts of power on their own. Which will work wonders to alleviate any excessive power draw from the PCIe slot and improve overclocking. In fact just a couple of days AMD’s AIB partners reported that with extremely good air coolers they’re seeing their RX 480s clock to 1480-1600Mhz. The reference designed RX 480 already draws 155-165 watts in games. So it’s at the very limits of what can be delivered through a 6-pin PCIe power connector and the PCIe slot. Simply put it’s starved for power for any serious overclocking. Expanding the power headroom by adding additional 6-pin or 8-pin PCIe power connectors or replacing the existing 6-pin with an 8-pin should address that directly. The VRM power delivery circuitry on the reference RX 480 printed circuit board is beyond impressive. More so when compared to the GTX 1080’s 5+1 power phase design which simply pales in comparison. The RX 480’s on-board VRM – voltage regulator – on the high-side is capable of delivering 40 amps from each phase at 125c, for a total of 240 amps. At room temperature each phase can deliver 66 amps for a total of 396 amps on the high-side and up to 600 amps on the low-side. The GTX 1080 Founder’s Edition voltage regulator can deliver 30 amps at 125c from each of its five phases, for a total of 150 amps on the low side, 246 amps less than the RX 480. At room temperature it goes up to 50 amps per phase for at total of 250 amps, 350 amps less than what the RX 480 VRMs can deliver at the same temperature on the low side. The GTX 1080 actually employs “doctor” mosfets which combine the high and low side into one IC. Hence why the PCB can get away with one mosfet per phase rather than needing two. It’s clear then that it’s simply a matter of feeding the RX 480 with enough power externally and not a design quality issue by any means. Having a good base to start from gives AMD’s AIB partners a great opportunity to differentiate themselves with their own designs. Many of which we have seen teased over the past couple of days with more to come.